Darjeeling: Thirteen cartons of stolen gelatin sticks containing around 325kg of powerful explosives broke new ground and have turned Darjeeling’s politics on its head. The theft in July from a nearby thermal power plant tore up the Gorkha Janmukti Morcha (GJM) between its president Bimal Gurung and Binoy Tamang, the emerging leader of the Nepali-speaking community. 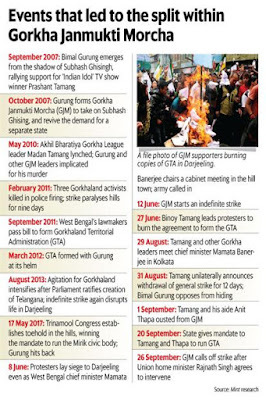 Backed by the state administration, Tamang, 55, is now taking on the erstwhile GJM leadership as he seeks to restart civic development in Darjeeling as the interim chairman of the Gorkha Territorial Administration (GTA). In an interview, Tamang slammed the GTA, a semi-autonomous administrative body which receives funding from both the centre and the state for civic development, as a “complete failure”. Asked why he still agreed to become its chairman, Tamang said it is only an “interim arrangement” to keep funds flowing for Darjeeling’s development. As he seeks to earn his people’s trust, he remains firm in his demand for Gorkhaland. A separate state for the community is the only “permanent solution” to the crisis. “The strike has been withdrawn, but the movement has not been suspended,” Tamang said. But under his leadership, the movement is taking a different course. Tamang has been promised Rs642 crore by the state administration, which he said will be injected into five priority areas: tourism, education, road connectivity, water supply and healthcare. That will put Tamang in direct conflict with several GJM leaders, now keeping a low profile, said a key Darjeeling district official, who asked not to be named. Wanted in several criminal cases, Gurung has had to flee his home. But his support base is still much bigger than Tamang’s, according to the official in Darjeeling. Tamang only has a toehold now, and must deliver on his promises to expand his support base, he added. Tamang disagrees. “What is the point of having a leader who is always hiding?” he asked. Recalling why he chose to break away from Gurung, Tamang said he wanted the GJM boss to return the stolen gelatin sticks at a time when the movement was getting increasingly violent. The state government’s strategy was to drive Gurung from his home and end the blockade by putting a moderate leader at the helm of the GTA, said an official in Kolkata, who, too, asked not to be identified. The movement would have imploded on its own causing huge embarrassment to Gurung. “Instead, as Tamang came into the picture with the support of the state, Gurung got an opportunity to distract people’s attention from his failure to deliver anything at all from the 105-day bandh,” this official said. 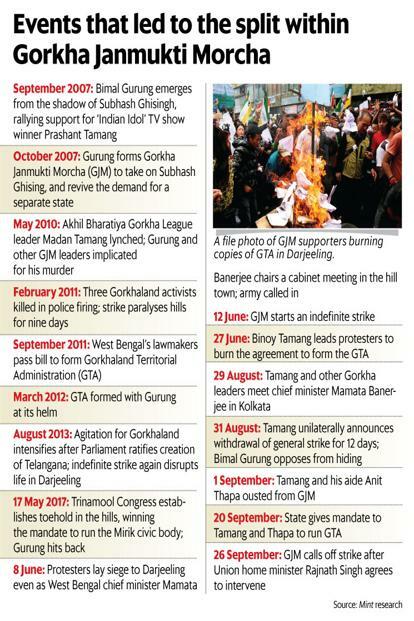 Tamang is now up against “huge vested interests”, said the Darjeeling district official cited above. For instance, hotels in Darjeeling routinely have to buy water from a GJM-backed cartel, according to the official and hoteliers. If Tamang seeks to addresses the problem of poor water supply, he could potentially drive aground an established business controlled by GJM leaders. Same is true for road works, which is controlled by a clutch of contractors, the Darjeeling district official said. “And finally, if Tamang chooses to focus on education and tourism, he will have to put an end to disruptions,” he added. Thirteen cartons of stolen gelatin sticks containing around 325kg of powerful explosives broke new ground and have turned Darjeeling’s politics on its head.